Avivo is dedicated to cultivating creativity through music. We are a community of musicians devoted to the art of teaching drawn together by the legacy of educator Grace Newsom Cushman. We believe in teaching music as a language that is available to all as a means for personal creative expression. Our approach engages both the teacher and the learner in actively building fluency with musical materials, playfully experimenting with new concepts, and thoroughly integrating these materials and concepts in wholehearted self-expression through original creation. We serve the music community by offering workshops, mentorships, curricular consultations, and publications that make music education a lively and transformative experience. Here are examples of the kinds of work Avivo Teaching Artists have done in the past. We invite you to view this list as a sampling of the ways we might collaborate with you. Creative Tension & Transformational Learning. A partnership with Junior Composers. Workshop sessions included: The Choral Experience; Creative Tension & Transformational Learning; Creative Activities Classes in Musicianship and Rhythms; Pedagogy Roundtables. University of Minnesota, Twin Cities; July 11-13, 2016. Teaching Artists: Patricia Plude & Leo Wanenchak. Teacher Training Institute 2015 – Courage, Creativity & Authenticity in Music Making & Teaching. A partnership with Junior Composers. Workshop sessions included: The Choral Experience; Cultivating Courage, Creativity & Authenticity Through Improvisation; Musicianship & Improvisation; Creative Musicianship in the Private Lesson; Rhythm & Improvisation; Small Steps in Conquering Large Repertoire; Spontaneous Art Song; and Integration Sessions. University of Minnesota, Twin Cities; July 16-18 2015. Teaching Artists: Patricia Plude & Leo Wanenchak. Junior League of Baltimore. Vocal Play: Putting Body, Mind & Heart in Your Singing. A half-day workshop for The Larks, the choral ensemble of The Junior League of Baltimore. Baltimore, MD; October 26, 2014. Teaching Artist: Patricia Plude. Piano Teachers Forum of Central New Jersey. Climb Every Mountain: Performance Fluency Through Gathering Musical Materials. A half-day workshop for the Piano Teachers Forum of Central New Jersey. December 5, 2014. Teaching Artist, Leo Wanenchak. Teacher Training Institute 2014. A partnership with Junior Composers. In this creative, one and one-half day gathering of Midwestern music teachers, participants engaged first as adult learners, opening up their creative voices and building confidence in their ability to improvise and compose. This was followed with active exploration of the pedagogy of improvisation and composition through a variety of modalities. Workshop sessions included: Free Improvisation; The Choral Experience, Rhythms & Improvisation, Musicianship & Improvisation, and Composers Drills. University of Minnesota, Minneapolis; July 19-20, 2014. Teaching Artist: Patricia Plude. MacPhail Center for Music. Helping Our Students Develop a Personal Creative Voice: Deepening Our Tools of the Trade. A three-hour workshop in which studio teachers actively explored simple and effective ways to approach improvisation and composition within the context of individual or group instrumental / voice lessons. MacPhail Center for Music, Minneapolis, MN; June 8, 2014. Teaching Artist: Patricia Plude. Incredible Children’s Art Network (ICAN). Cultivating Courage, Authenticity & Excellence in Teaching. A three hour teaching master class for ICAN Teaching Artists and Westmont College Musical Mentors. Using simple body movement and music improvisation activities, participants explored and practiced artistic courage and authenticity. They also learned and practiced an effective approach for observation, reflection, and response – to be used both in self-evaluation and in mentoring one another. Franklin School; Santa Barbara, CA; November 2013. Teaching Artist: Patricia Plude. Water City Chamber Orchestra. Write your own Blues! A 90-minute workshop for middle school students resulting in original blues compositions (both poetry and music), in collaboration with singer Janet Planet. Oshkosh, WI; December 2010. Teaching Artist: Brooke Joyce. Take a Stand Symposium. Creativity & Improvisation: Empowering Individuals, Transforming Communities AND Engaging our Students Actively & Creatively: Deepening Our Tools of the Trade. Two days of teacher training and discussions: a collaboration among Take A Stand, the Department of Music and the Center for Social Entrepreneurship at Duke University, and KidZNotes, an El Sistema inspired youth orchestra program. Durham, NC; February 2013. Teaching Artist: Patricia Plude. Water City Chamber Orchestra. Songwriting 101. Two one-hour workshops, spaced one month apart, for middle school choir students, resulting in original compositions (both poetry and music) for voice and piano. Perry Tippler Middle School, Oshkosh, WI; Winter 2009. Incredible Children’s Art Network (ICAN). Engaging our Students Actively & Creatively: Deepening Our Tools of the Trade. A three-hour teacher training for ICAN Faculty and Westmont College Musical Mentors offering creative tools for teaching rhythms, choral studies, and improvisation. Workshop also included focused work with Pristine Machine by Ted Masur, the major orchestral work the children were learning at the time. Westmont College; Santa Barbara, CA; March 2013. Teaching Artist: Patricia Plude. YOURS Project and the People’s Music School. One-day professional development seminar for faculty of the People’s Music School and other El Sistema inspired programs in the mid-west, focused on improvisation as a social process. Sponsored by Take-A-Stand, a partnership of Bard College, the Longy School of Music of Bard College, and the Los Angeles Philharmonic. Co-presented with Judy Hill Bose, Director of Teacher Education and Educational Initiatives at the Longy School of Music of Bard College. Chicago, IL; December 2012. Teaching Artist: Patricia Plude. Music National Service MusicianCorps Fellow Teacher Training. A collaboration between MusicianCorps San Francisco and The Walden School Teacher Training Institute. A four hour interactive workshop offering MusicianCorps Fellows creative tools for teaching solfège, rhythms, music notation, and improvisation. San Francisco, CA; April 2011. Teaching Artist: Patricia Plude. San Francisco Opera ARIA Network. MAD ART (Melody, Acoustics, Dynamics, Articulation, Rhythm, Tempo) – Part 2: Solfège & Rhythms. A one-hour professional development workshop offering public school teachers solfège & rhythms skills to use in arts integration lessons. San Francisco, CA; February 2011. Teaching Artist: Patricia Plude with Andrea Yannone, Keeping Score Education Program Manager. South Bay Music Teachers Collective. A once a month gathering of music teachers designed to offer support, education, rejuvenation, and inspiration through study, conversation, music improvisation, movement, storytelling, and visual arts. Menlo Park, CA; Ongoing, Winter 2014 – present. Teaching Artist: Patricia Plude. The following Mentorships were completed under the auspices of The Walden School Teacher Training Institute. Joo Won’s Project: Joo Won designed, created, and maintained a blog to introduce and teach electroacoustic music in Korea (emusic.egloos.com). His blog remained as the top search result for electronic music in the Korean language (전자음악) for five years. Through this blog Joo Won met a great number of students and collaborators, and many online meetings turned into opportunities for performance and teaching. Building on what he had learned, Joo Won then went on to create a new online educational project: the production of 100 videos of live electronic music (www.100strangesounds.com). Project dates: September 2005-August 2006. Teaching Artist Mentor: Tom Lopez. Erika’s Project: Erika applied tools and teaching concepts used by Avivo artists to develop a course for teaching music fundamentals through the voice. Using slinkys, balloons and rubberbands she made the experiments and resulting discoveries accessible and understandable to beginning vocal students. While approaching the acoustics topic of sound and “envelope”, Erika set up a parallel between “attack, sustain, and release” and learning specific vocal techniques. Throughout this groundbreaking work, the author continuously invented new and challenging ways to drill music elements using the voice alone. Project dates: December 2010-July 2011. Teaching Artist Mentor: Dr. Pamela Quist. Meighan’s Project: Meighan strengthened her personal musicianship and improvisation skills using materials developed by Avivo teaching artists. Specifically, she studied modes, modal harmony, and seventh chords as consonant sonorities. Using her increased confidence with improvisation, she facilitated an improvisation workshop with her chamber ensemble for high school music students. She also explored creative application activities in her lessons with private clarinet and piano students. Project Dates: October 2007 – August 2008. Teaching Artist Mentor: Bill Stevens. Dina’s Project: Dina expanded her own piano horizons through improvisation and composition, while concurrently exploring ways to encourage students to create from the very beginning of the learning process. As part of this project Dina created a handbook of improvisation / composition activities for the beginning to intermediate pianist that she uses in her own piano studio. Project Dates: February 2010– October 2010. Teaching Artist Mentor: Patricia Plude. David’s Project: David developed a complete one-year academic course for teaching class guitar based upon the early levels of the Musicianship Course as described by Avivo authors in The Walden School Musicianship Course, a Manual for Teachers. Converting carefully designed practice techniques to guitar, he also provides ways to encourage creativity through individual and group improvisations on basic materials like musical intervals. Today he is using these fresh and exciting methods on a regular basis in his guitar teaching. Project dates: September 2007-July 2008. Teaching Artist Mentor: Dr. Pamela Quist. Fay’s Project: Fay constructed and implemented a plan to systematically introduce solfège and rhythms (as detailed in the Solfège & Rhythms Supplement to The Walden School Musicianship Course: A Manual for Teachers) to her elementary music students from pre-K through Grade 5. She also introduced solfège and rhythms work into rehearsals with her children’s choir. As part of this implementation process Fay continued to develop her own personal fluency with the syllables and hand signs as well as comfort with the drills and games used in this curriculum. Her ultimate goal for this project was to give students effective musicianship tools that would enable them to sing with more accurate pitch, take significant steps toward gaining fluent music reading skills, and finally achieve a much richer and more satisfying vocal and choral experience. Dates: September 2006 – July 2007 Teaching Artist Mentors: Patricia Plude and Leo Wanenchak. Luther College. Designed music history curriculum that actively guides students in expressing themselves creatively by listening, thinking, and writing about music. 2005-2013. Teaching Artist: Dr. Brooke Joyce. Luther College. Designed Collaborative Composition curriculum for the undergraduate composition studio. 2005-2013. Teaching Artist: Dr. Brooke Joyce. Santa Clara University. Designed six quarters of an integrated Aural Skills & Theory curriculum for undergraduate music majors & minors, including courses in Improvisation and Beginning Composition. Implementation included mentoring of music faculty. 2006 – 2012. Teaching Artists: Patricia Plude & Dr. Pamela Quist. Lutheran Summer Music (LSM), Luther College. Designed a three year musicianship curriculum using the rich repertoire of liturgical music from the Lutheran tradition. 2009-2012. Teaching Artist: Dr. Brooke Joyce. Santa Clara University. Designed and Implemented curriculum for an undergraduate seminar that explored historical relationships between technology and music and contemporary practical applications. 2003 – 2004. Teaching Artist: Marshall Bessières. The Walden School. Designed and implemented Computer Musicianship, a curriculum that enables students to compose for the computer as a unique instrument. Students record their own source material using a portable recording system (synthesizers and note sequencers are not used), upload this source material to a computer, and manipulate the sounds to improvise and compose electronic and electro-acoustic works. The curriculum also includes a significant listening survey of classic and contemporary electronic music. 1999 – 2002. Teaching Artist: Tom Lopez. The Walden School. 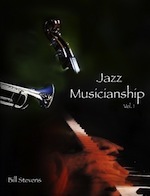 Designed and implemented Jazz Musicianship, a comprehensive course of study in jazz theory and improvisation. Students are led to discover each new concept incrementally. Once discovered, concepts are explored and drilled thoroughly, using singing, spelling, reading, writing, listening, and playing. Students are then asked to make each concept their own by applying it in improvisational and compositional activities. The intent is to impart rigorous understanding of the jazz language and dialects while actively fostering the student’s unique expressive voice. 2001 – 2010. Teaching Artist: Bill Stevens. Minnesota Music Teachers Association (MMTA). Improvisational Music Theory: A Path to Creative Composition. Annual State Conference, Plymouth, MN, June 2014. Presenting Teaching Artist: Patricia Plude. Northwestern University Music Education Conference. Guest speaker and participant on a panel of composers and music educators leading a community conversation about teaching composition in the academy. Discussion questions included, “What is a successful approach to teaching composition in the academy?” and “How should we consider changing or refining the academy with regard to theory, performance, and conducting instruction as well as pre-service teacher education?” June 13-14, 2011. Teaching Artist: Pamela Layman Quist. College Music Society. Creativity Without Ideas: Taking John Cage At His Word. Great Plains Regional Conference, Kearney, NE, 2006. Presenting Teaching Artist: Brooke Joyce. Music Educators National Conference (MENC). Improvisational Music Theory: A Path to Creative Composition. Eastern Division Conference, Hartford, CT, 2007. Presenting Teaching Artist: Patricia Plude. College Music Society. Music as Memorial: Steve Reich’s “Different Trains.” Great Plains Regional Conference, Vermillion, SD, 2007. Presenting Teaching Artist: Brooke Joyce. Music Teachers National Association National Convention (MTNA). Releasing the Music Within. National Conference, Washington, D.C., 2001. Presenting Teaching Artist: Patricia Plude. San Francisco Ballet School. From Topics to Concepts: Teaching Music to Dancers. A consultation with San Francisco Ballet School music teachers designed to a) support them in building creatively on the success of their first year of music classes for advanced level, pre-professional dancers; b) offer specific tools for creative participatory music education especially appropriate to ballet dancers; and c) open conversations about how to craft an innovative three-year, revolving curriculum. San Francisco, CA; June 5, 2014. Teaching Artists: Patricia Plude & Pamela Quist. MacPhail Center for Music. Courage, Creativity, Authenticity and You. A 3-hour, interactive keynote address for the MacPhail Center’s annual Anacrusis Day. MacPhail Center for Music, Minneapolis, MN; September 11, 2015. Teaching Artist: Patricia Plude. San Francisco American Mavericks Concerts. Inside Mavericks, two interactive pre-concert events designed to give San Francisco Symphony concert patrons a taste of the musical language and compositional techniques of Henry Cowell, Lukas Foss, and John Cage. Davies Symphony Hall; San Francisco, CA; March 2012. Teaching Artists: Patricia Plude & Pamela Quist. Read the San Francisco Examiner review. Luther College. The Music and Art of Minimalism. A one-hour interactive class exploring the sounds and images of minimalism, culminating with an improvisation based on Steve Reich’s “Clapping Music.” Decorah, IA; February 2008, 2009 and 2010. Teaching Artist: Brooke Joyce. Jesuit School of Theology. Improvisation and Spiritual Formation. A three-hour interactive class exploring the intersection of improvisation, embodied prayer, and individual / communal faith formation. Berkeley, CA; May 2012. Teaching Artist: Patricia Plude. Oberlin Conservatory. Freedom to Create: Improvisational & Technological Skills for Music Teachers. A five-day graduate seminar as part of the Oberlin Conservatory Master of Music Teaching Program (MMT). Oberlin Conservatory; June 27 – July 1, 2015. Teaching Artists: Dr. Tom Lopez & Patricia Plude. Oberlin Conservatory. 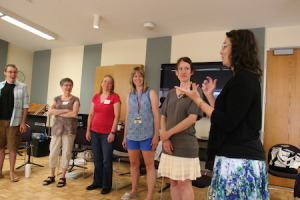 Teaching Improvisation & Composition: An Intensive for Music Teachers, summers, 2009, 2011, 2013. A five-day graduate seminar as part of the Oberlin Conservatory Master of Music Teaching Program (MMT). (2009 & 2011 were a collaboration between Oberlin Conservatory and The Walden School Teacher Training Institute). Teaching Artists: Dr. Tom Lopez & Patricia Plude. Longy School of Music of Bard College. Creating Music I and Clinical Practice I, January – March 2013. Two 10-week graduate courses as part of the Longy School of Music of Bard College Master of Arts in Teaching Program (MAT). Teaching Artist: Patricia Plude. 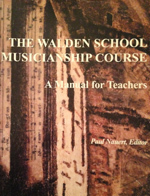 The Walden School Teacher Training Institute. Developing Creative Expression.Week long summer Intensives designed to help music educators sharpen their musicianship skill, enrich their teaching with imaginative activities, and more effectively guide the creative voices of their students. Summers, 2005-2011. Teaching Artists: Marshall Bessieres, Brooke Joyce, Tom Lopez, Patricia Plude, Pamela Quist, Bill Stevens, Leo Wanenchak. San Francisco Symphony Keeping Score, June Institute. A collaboration between SF Symphony Keeping Score Education and The Walden School Teacher Training Institute. A three-day music Intensive for public school teachers engaged in the work of arts integration. Classes included Solfège, Rhythms, Acoustics, and Chorus. San Francisco, June 2010. Teaching Artists: Patricia Plude, Pamela Quist, Leo Wanenchak. Guest Faculty Artist: Loretta Notareschi. Dublin School, Dublin, NH: Artist in Residence for four weeks, offering courses in musicianship, mentoring Dublin’s music faculty, and playing a jazz concert for the community. This residency was a collaboration between Dublin School and The Walden School Teacher Training Institute. April – May, 2010. Teaching artist: Bill Stevens. Dublin School, Dublin, NH: Artist in Residence for ten weeks, offering courses in musicianship and computer musicianship, mentoring of Dublin’s music faculty, and sound exploration activities for the school community. This residency was a collaboration between Dublin School and The Walden School Teacher Training Institute. March-May, 2011. Teaching Artist: Marshall Bessières. A unique blend of mastery and playfulness, the Avivo approach creates a rich environment for musical and personal growth. I would not be the musician and teacher I am today if I had not learned so much from this wonderful group of musicians and educators. Avivo's approach to music and music education brought me back to my classroom with a renewed feeling of excitement and purpose, and my students have responded with increased engagement and creativity. These bright and accomplished professional musicians have helped me find – and to continue to seek – approaches to teaching music that are both systematic and creative, both challenging and playful. [Avivo Teaching Artists'] pedagogy is founded on creating communities of learners, play theory, and the innate exploration of the creative, musical self. I have grown tremendously as a musician under the teaching and guidance of Jazz Musicianship instructor Bill Stevens.